TURNINGLEFTWITHONEHANDHOLDINGPHONE and other onsteering wheel. - 11/2/12 5:32 P.M. --This image was taken with a cell phone -- Not a safe practice! As we were stopped traffic signal at intersection of Lamar 6th heading north we noticed driver with left hand on steering wheel and right hand holding a cell phone. 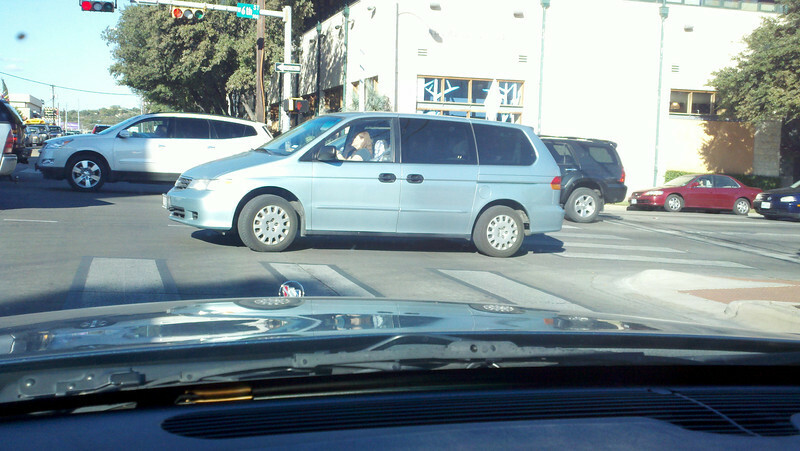 The driver is turning left toward south Lamar in rush hour traffic. Have you ever noticed how many drivers are using their hand held cell phones while driving? Here is photographic evidence. Zoom in and you will see her holding her cell phone in her right hand and driving with her left hand/arm?